Welcome to Tools Plus. Since 1979 we have been providing the local community with the broadest selection of Hand Tools, Power Tools, Woodworking Machinery and Accessories from top manufacturers. Whether you're shopping for Cordless Tools from Makita, DeWalt or Milwaukee, we have the tool to fit your needs. We began business with a 600 square foot rent, and from those humble beginnings have grown into our own 9000+ square foot building, located in Waterbury, Connecticut. We began our internet store in 1999, the early days of web commerce, with the same Yahoo Store we use today. Buying things on the internet has evolved in many ways, stronger types of security, more user-friendly shopping carts, quality of product images, and methods of marketing products. Throughout these changes, we have worked hard to stay on the edge of new technologies, and provide our internet customers with the best possible shopping experience. A while back, Home Depot moved into this area of Waterbury, right across the street from us, in fact. There was some initial worry that the direct competition with this giant would hurt our business, but after several years it is clear that that has not been the case. Although going up against a retail giant is never easy, not only have we thrived with them in our back yard, we have continued to succeed and grow at a controlled pace. One can never be sure exactly why we have done so well, but we like to think it is because we work hard to provide our customers with the lowest possible prices, friendly and extremely knowledgeable customer service, and a very diverse selection of products. The store itself is over 9000 square feet. The first floor is where all of our power tools, hand tools, and accessories are on display, and the shelves are stocked to the ceiling. 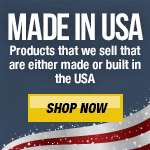 We have aisles dedicated to the most popular manufactures that feature interactive media to help you make your buying decision a quick and easy one. Upstairs is a showroom of some of our most popular woodworking machinery and equipment where you can get a "hands on" look at the next addition to your shop. The front counter of the store is the base of operations for the 100 plus years of combined industry knowledge behind the Tools Plus name. From here, many questions are answered, and solutions are forged in person or by phone. When you speak to someone at the front counter, you should expect an honest, detailed response to your questions. Unlike some Internet retailers that never even see their stock, the people at the front counter can be holding a tool in their hand as they describe it to you. 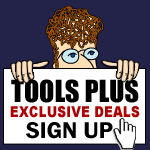 The plus in Tools Plus stands for the hands on knowledge that comes with every tool we stock and every sale we make. In the summer of 2010, Tool-Plus opened up a brand new automated distribution center in the heart of scenic Prospect Connecticut. The new warehouse features a computer-based order processing system that allows us to more accurately and more efficiently fill orders, while at the same time giving us room to stock a wider variety of items in greater numbers. The added room allows us to take advantage of a wider variety of manufacturer volume deals and of course, pass the savings on to you. "60 Scott" as we lovingly refer to it, also features an expanded office area for our customer service and internet personnel, allowing us to better serve both our internet and local customers. Moving forward, we plan to keep expanding and growing to continue to meet the needs of our loyal customers. And through it all we will always strive to maintain the high level of personal customer service that we've become legendary for. 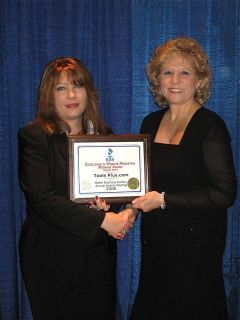 Tracy LaCombe on behalf of Tools Plus receiving the 2008 Honorable Mention Web Site Marketing Message Award from Paulette Hotton Scarpetti, President and CEO of the BBB. This award recognized Tools Plus as having a website that exemplifies ethical marketing by meeting standards of advertising and selling practices; educates consumers by offering detailed information about the company's products, services and/or industry; includes the company's accessibility information and includes description of the company's policies pertaining to refunds/exchanges, guarantees/warrantees and/or how consumers may obtain service and finally a website that is easy to navigate. Eric Savelle is the owner of Tools Plus. He started the tool selling business in 1980 with nothing but $5,000, and a co-signed $20,000 loan. He bought a basement full of merchandise and held liquidation sales at hotels, having no permanent location until he began to rent a small 600 square foot store. From youth, he always loved anything with a motor, but all of his learned knowledge about the industry came from years of listening to his customers' stories, and benefiting from the wisdom and experience that they impart. The philosophy that he built this business with was to always treat customers like he would want to be treated in their place. At 57 years old and after 32 years in business, he has thoroughly enjoyed the process of preparing for the next, undoubtedly exciting, 32 years. Jeanne was born in Brooklyn, NY next door to Jennifer Lopez and raised in Shrub Oak, NY. She moved to CT to be with her husband and has been with Tools Plus since 2003. Her background is in Insurance and has a degree as a Professional Liability Underwriter and Insurance Broker, along with a 4th Degree Black belt. Since joining Tools Plus, she has been a Systems Analyst and quickly became our Vice President due to her skill, dedication and flawless fashion sense. She enjoys her job because of the interaction she has with phone and internet customers, and she works hard to troubleshoot problems and make sure that everyone is satisfied with their ordering experience. Jeanne is a mother of two grown children and Lucy the dog and Buba, Jack and Nelly, their three cats. She is also blessed with a mini-army of grandchildren that have been unanimously voted the cutest of all time. Margie is our most senior employee, with us for almost 28 years. She works from home as she raises her two daughters as a single parent. She is our purchasing agent and through the wonders of modern technology she is able to work for us full time while raising her kids full time. Margie not only buys the tools for Tools Plus, she personally uses and tests them out through her many home building projects. She loves gardening and landscaping and being involved with her daughters in Girl Scouts, soccer, and dance. Struggling to care for a growing family, Johnny came to us from Oxford Connecticut and works as our Warehouse Operations Supervisor. Recently assigned to "light duty", Johnny has resigned himself to "eating for two" and coming up with a name for his new bundle of joy. After his upcoming maternity leave, we expect Johnny to return back to work with the same sharp wit and sense of humor that got him where he is today. Good luck Johnny!! Kirk is our resident web site and IT guru. In addition to maintaining the harmony between the digital customers and Tools Plus, he is also responsible for many of the descriptions, product write-ups and product images on the site and manages to keep our huge database of products tidy and clean. He is a music connoisseur who can operate the fork lift like a true champion, and he is never one to shy away from happy hours. When not hard at work, Kirk enjoys spending time with his wife and 2 teenage kids while avoiding yard work and excessive outdoor activities. Lucy is the Tools-Plus "Jill of all Trades". One moment you'll find her crunching computer code and the next she'll be on the loading dock motivating the shipping department. More than just a watch dog, Lucy possesses those prized canine skills that have catapulted her to the top of the food chain. Her "take no prisoners" attitude is a perfect compliment to her "scratch my belly" softer side. Rickie has been with Tools Plus for over 8 years. Just an all around great guy, who shares his life with his lovely wife Cheryl and his daughter Kelly. You can find Rickie working tirelessly in our Shipping Department making sure all of our customer shipments are packed and shipped on time, usually with his side kick, Lucy, by his side. She always knows where she can get a kiss, scratch on her belly and let us not forget the doggie treats he has tucked away. Brian is one of the most colorful members of the Tools-Plus team. As our Accounts Receivable Manager his duties and responsibilities transcend many facets of our organization and he has certainly become "Brian on the Spot". Brian and his 3 cats live the New England Dream. In Brian's free time he loves to duck pin bowl and work out in the yard. Debbie comes to Tools-Plus with many years of customer service experience under her belt. The friendly voice on the other end of the phone, Debbie always goes the extra mile to keep the customer happy even at the expense of her own personal needs. Originally hailing from Stamford Connecticut, Debbie currently resides in Naugatuck with her husband. She is the proud mother of 3 sons who have all grown up and moved away (except her son Joe). With an empty nest, she now focuses on filling up her pantry with snacks for her grandchildren who love to visit. This is Joe, and Joe's a FUN guy. Joe is our marketing and graphics guru. He's responsible for much of the visual stimulation our users experience on the web site. Joe graduated from Central Connecticut State University in 2010 with a Bachelor's Degree in Graphics Technology. Besides working, Joe also enjoys playing in his band "Polka Explosion", check them out on Facebook. He's an accordion virtuoso and has high aspirations of playing Oktoberfest in Munich someday. Joe doesn't like having his picture taken, so we had to sneak this shot in over the cubicle. Brandon ("Brando" for short) came to Tools Plus with quite an impressive resume'. After spending 8 years earning his degree in "Awesome", he decided it was time to up the ante and make a difference in the online retail industry. Brandon uses his many talents to help keep the flow of product at our distribution center smooth and accurate, and although you may never see or hear from him, chances are he has laid hands on the fancy new tool you just purchased. Raised on the mean streets of the Connecticut Valley, Chris is no stranger working under pressure. After a brief stint at an all-male on male massage parlor, Chris turned his attention to tools. All kinds of tools, in all kinds of colors and configurations. An avid football fan and former High School football equipment manager, Chris makes it his responsibility to make sure that when you shop at Tools Plus and Tools-Plus.com, your experience is nothing but warm and fuzzy from beginning to end. After a brief stint as a stand in for Posh Spice during the 2010 Spice Girls reunion tour, Terri decided to hang up her gold microphone and settle down in the Tools-Plus shipping department. Terri’s attention to detail and borderline passive aggressive disposition are a big part of the reason we get your packages out so fast. There are other reasons of course...but I mean, look at the size of her scanner! This is Dave. Honestly, we’re still not sure what Dave does here or who hired him. He just kind of showed up one day and started working. To be fair, his productivity is second to none, and he smells like cinnamon and apples. But the fact that he keeps showing up every day and not getting paid makes us wonder. We took 15 pictures of Jason, and this was literally the most flattering one. Also known as the "Man with the 1000 Yard Stare", Jason is one of the newest members of the Tools-Plus tech team. In his spare time, Jason likes to think about becoming a Wizard and maybe going outside. Shhhhhhhhhhhhhhhhhhhhh, be very very quiet, we're going to tell you about Rob. Rob is a man of very few words; but the words he speaks speak volumes. His wealth of knowledge means he'll be certain to tell you what the best bang for your buck is, or what the torque of that drill is, but nothing much beyond that. Come on down to our retail location and ask Rob how he's doing...we dare you. Chuck is our go to sales guy at our retail outlet and is an avid Red Sox and Bronco's fan (which is about as strange of a combination as you can get we think). He has a 12 year old daughter and is an avid poker player. So he certainly knows when to hold 'em and when to fold 'em. He'll count your money, but only if you're paying cash. That's really all we got for this guy. There's 2 things you need to know about Matt. 1: He knows Kung-Fu, and not that fake movie Kung-Fu, the real deal Kung-Fu where he could like put you in traction with nothing more than his pinkie. 2: He has no shame in admitting his love for 1990's Romantic Comedies. He's seen Pretty Woman 37 times, and according to him Julia Roberts is a "blessing straight from heaven".